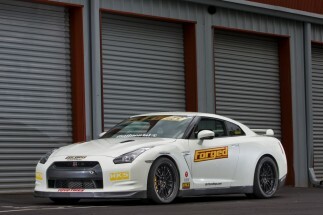 Forged Performance Nissan GT-R continues is to shatter another long standing track record at Carolina Motorsports Park. Forged had a really great weekend at Carolina Motorsports Park, in spite of the 6-8 inches of snow that fell on Friday night which made for a VERY exciting haul from Atlanta to Kershaw, SC. We arrived to the track on Saturday morning, to the sight of a half foot of snow over the entire track. Surprisingly by noon, the snow melted and the track completely dried out. This bested the previous record for over 3 full seconds previously held by a 996 TT back in 2008. Thought I would share the results, and include a quick video of one of the faster laps. The track was a handful to say the least and very green after all the snow. Grip was lacking, and the track was very inconsistent through the day. The Nissan GTR was Piloted by Sharif Abdelbaset.